Cardinal Stanislaw Dziwisz is perfectly aware that in our age of terrorism, some young people (or their parents) might be afraid of a World Youth Day [or pilgrimages to Poland]. To this, he replies, Be not afraid! Krakow is a city that has a strong emotional impact: it is the Diocese of Saint John Paul II, the Pontiff who led the greatest number of World Youth Days. 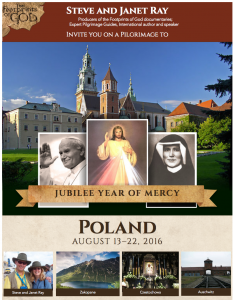 Teresa Tomeo and I invite you to join us in Poland, not for World Youth Day but for a more tranquil trip — on our pilgrimage August 13-22, 2016. Registrations are increasing as the date gets closer but we still have seats left. 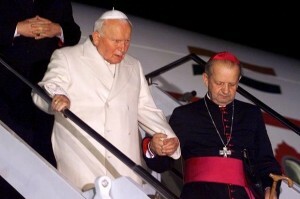 We will follow the footprints of St. John Paul II, St. Maria Faustina and the Divine Mercy and St. Maximilian Kolbe all the way to his death cell in Auschwitz. Mass every day at amazing sites and history galore. You can find out more on our website at www.FootprintsOfGod.com or by contacting Suzanne at sparran@ctscentral.net or (313) 744-2530 or toll-free 1-800-727-1999, ext.121. For our other trips to Lourdes and Fatima, Guadalupe, Holy Land, Rome, St. Paul Cruise, Germany and more visit FootprintsOfGod.com.